Product prices and availability are accurate as of 2019-04-17 14:53:16 EDT and are subject to change. Any price and availability information displayed on http://www.amazon.com/ at the time of purchase will apply to the purchase of this product. Hand Crafted in the USA by D.G. 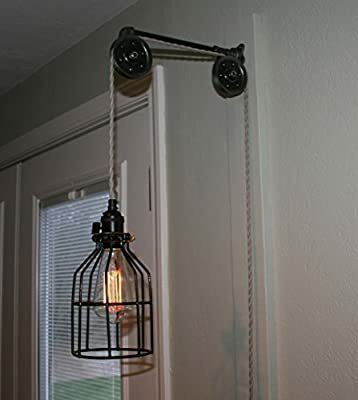 Bowden // This is such a cool look for your Industrial Decor!! 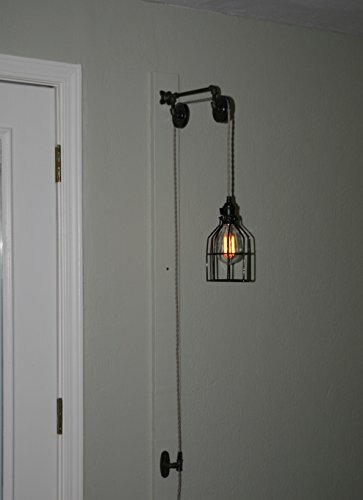 The steel pipe and 2 aged pulleys with the Black Rubber Coated Cage hanging as high or as low as you want. Comes with 9 foot cord and a plug on the end. The 9' allows you to raise or lower the light, and can be anchored where you want it. // UL Listed Socket rated at 250w/250v. Wire is rated up to 300v. // Light bulb NOT included. .... We can shorten the bracket length as low as 10" and lengthen it as long as 14". Please email us if you want something other than 12" bracket. ** We take great care in building our light fixtures, paying close attention to detail and using UL Recognized Components, however, as a whole fixture, it is not UL listed. Search IndustriaRewind for more lighting fixtures. Pictured with a 12 inch bracket. Bracket can be built at 10 or 14 upon request (please email immediately after your purchase to make this change). 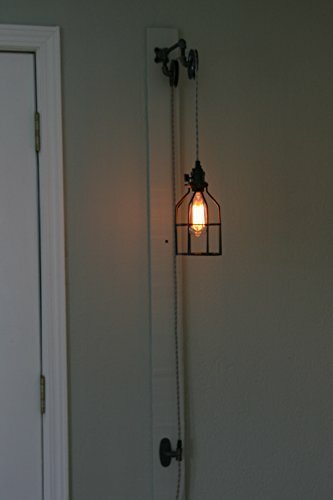 UL Listed Metal Socket with Paddle Switch (on/off switch) rated 250w/250v Sand/Putty Vintage Style Twisted Cloth Covered Cord (Black or brown available upon request) Quick & Easy installation. Just mount into a stud and plug into an outlet. No electrician needed.